The other morning I was standing in my kitchen and mentioned to my daughter that the upcoming Monday was August 1st. She was stunned. STUNNED I tell you. Then for good measure, I put my fist in the sky. As all parents know, August is typically the beginning of the school year and while I will no doubt shed some tears as my youngest (and last) child heads off to school as well, I am also relieved to get this family back into a routine. This year it’s even more interesting in the school system as 2016 is the year that EVERY CHILD attending school is part of Generation Z.
Gen Z is the group born between 1995-2012, which covers both of my children (2005, 2011). Generation Z kids learn differently than others before them. They were born in the era of technology, but research conducted by the Post-it® Brand proves that they still love writing things down. To see a full infographic that explains more about this Post-it® Brand study, please click here. 85% of Gen Z learn best when they use both digital and non-digital tools for school work. For example, they may read an assignment from their digital textbook but write down notes to prepare for a quiz. 83% feel they have more freedom with their note-taking style when they handwrite notes compared to using a digital device. 81% reported that they would feel restricted if they could only work on digital devices. I see this with both of my children that react better with lists and drawing. I don’t know if my household is unique, but most of our tablets and tech have more to do with playing than learning. When it comes to remembering to study, reading, comprehending, or even chores, we all operate on schedules, calendars, and writing it down. My kids also love to use Post-it® Flags to mark important information in their textbooks so they remember to go back and study it later! Which leads me back to school prep. This year, now that I will have two kids to organize and keep on task, I want to harness good old-fashioned time management and keeping on task by writing things down. To accomplish this, I decided to create a “FAMILY HUB” wall between my kid’s rooms to help “Make it Stick.” To demonstrate the power of writing, Post-it® Brand is encouraging people nationwide, especially Gen Z students, to write down goals, aspirations and more, as a way to make them stick and accomplish tasks, both big and small in the new school year. Step 1: Find a space! I have been contemplating what to do with this wall for a pretty long time. 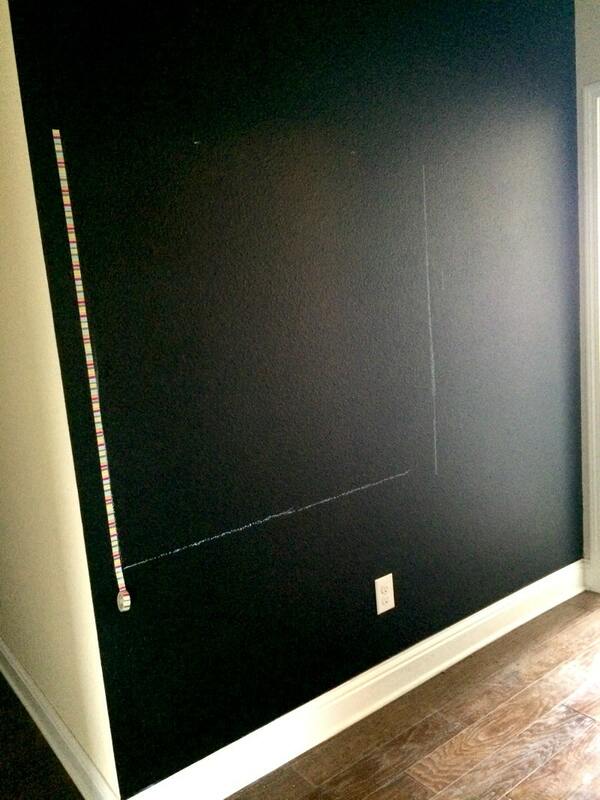 I have also always wanted a chalkboard wall and it occurred to me, putting it here would be fantastic. 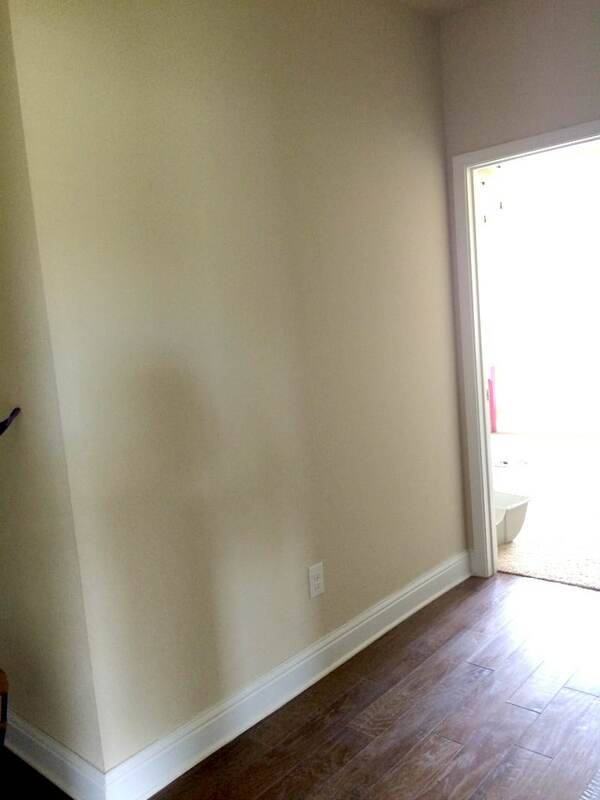 The kid’s rooms both fall on either side of this wall. I could easily communicate chores, reading assignments, vacations, and put up reminders about sports or even special TV shows. In turn, the kids will start to learn to put up their own reminders and learn the art of planning. 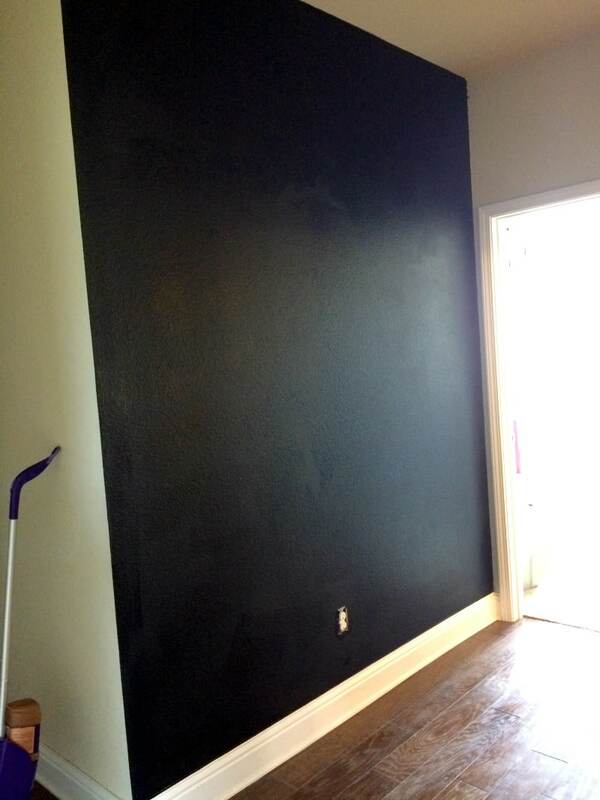 To be honest, convincing my husband that a black chalkboard wall was a good idea was not easy. So I waited for him to be on a business trip to Alaska. Step 2: This is where the hard part started. I wanted to create a calendar in this large space but leave enough room for coats or backpacks to hang. I am sure over time I will develop other things in this space. Figuring out what size to make the calendar was just a guess. I had a friend come over and we simply eye-balled the area and used tape to create the boxes. I am sure there is some mathematical way to figure out the perfect symmetrical box, but we just did it all by hand and with no measurements. Tape and creativity. It’s not perfect but I loved how it started to form up. Step 3: Now that your calendar is built up, I knew we needed a place to hold our chalk and Post-it® Super Sticky Notes. 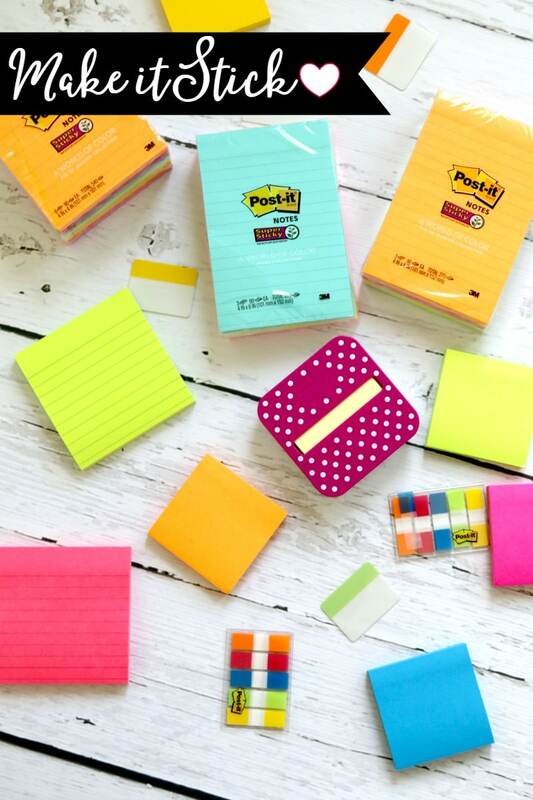 Post-it® Super Sticky Notes: To write down chores, school reminders, and lists. 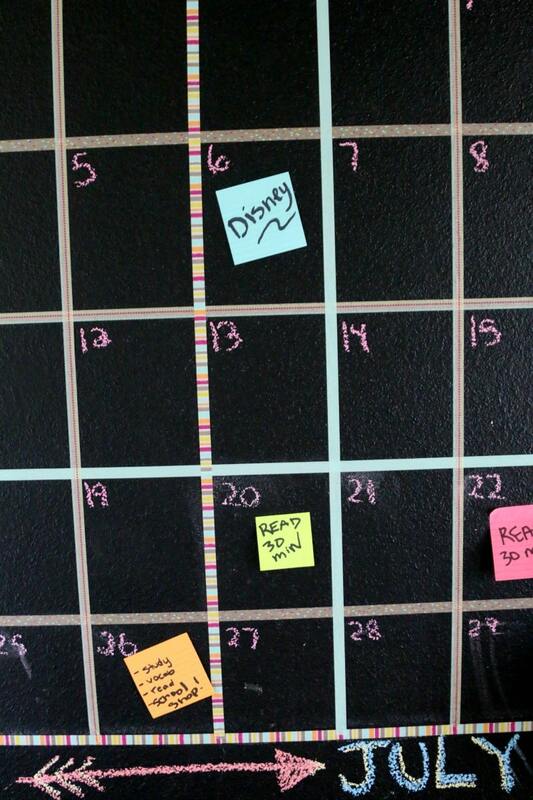 The great thing about adding our Post-it® Super Sticky Notes to the calendar is that once a task is completed, it could be removed! There is something very satisfying about being able to physically remove a task! I picked up a little wooden box for about $6 (unpainted). I brought it home, painted it blue and then used command strips to stick it on the wall. Step 4: Now the fun part! 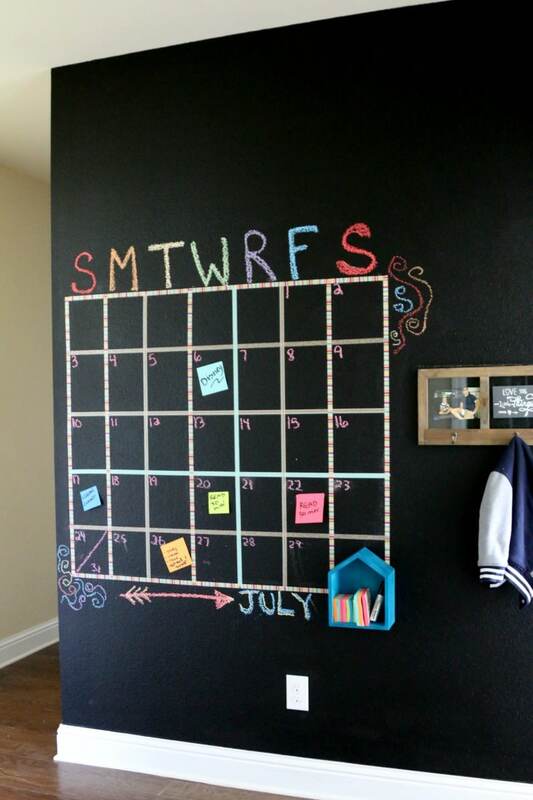 You can add your dates, month, and even little chalk drawings. Once you are done, start adding all your tasks! I don’t know anyone that doesn’t LOVE all the Post-it® Super Sticky Note options, so this is the best part. I especially love these colors of Post-it® Super Sticky Notes from the World of Color Miami and Rio de Janeiro collections! The wall is just happy and colorful, such a change from the blank canvas it once was! The beauty of using Post-it® Super Sticky Notes to keep on task, is that they can also go WITH you to other places in the house! I cannot tell you how much I enjoyed this project and the end result. I almost feel prepped for school, even if the kids are still doing sad faces. Visit Post-it.com/study for additional information on Post-it® Products, Gen Z and study tips. Share how your family is accomplishing their goals this back to school season using the hashtag #MakeitStick and tagging @Postit. Follow Post-it® Brand on Twitter, Instagram, Facebook, and Pinterest. This post is sponsored by Post-it® Brand. Plus, do not forget to pin this post for inspiration on your very own wall and family hub.